A herbarium (plural: herbaria) is a collection of preserved plant specimens and associated data used for scientific study. 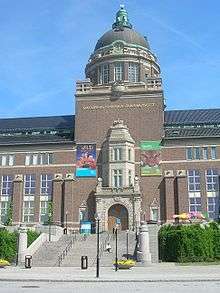 The term can also refer to the building or room where the specimens are housed, or to the scientific institute that not only stores but uses them for research. The specimens may be whole plants or plant parts; these will usually be in dried form mounted on a sheet of paper but, depending upon the material, may also be stored in boxes or kept in alcohol or other preservative. 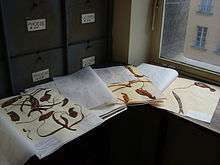 The specimens in a herbarium are often used as reference material in describing plant taxa; some specimens may be types. Herbaria also preserve a historical record of change in vegetation over time. In some cases, plants become extinct in one area or may become extinct altogether. In such cases, specimens preserved in an herbarium can represent the only record of the plant's original distribution. Environmental scientists make use of such data to track changes in climate and human impact. 1 2 "Preparing and Storing Herbarium Specimens" (PDF). Conserve O Gram. National Park Service. November 2009. Retrieved 24 March 2016. ↑ "Fungarium". www.kew.org. Royal Botanic Gardens, Kew. Retrieved 2 February 2016. ↑ "Wood collection (xylarium)". www.kew.org. Royal Botanic Gardens, Kew. Retrieved 2 February 2016. ↑ "Liberty Hyde Bailey Hortorium". plantbio.cals.cornell.edu. Cornell University College of Agriculture and Life Sciences. Retrieved 2 February 2016. 1 2 3 Chater, Arthur O. "Collecting and Pressing Specimens" (PDF). www.bsbi.org.uk. Botanical Society of Britain and Ireland. Retrieved 2 February 2016. ↑ "HerbWeb - What is a Herbarium". apps.kew.org. Retrieved 2016-03-25. ↑ Funk, Vicki (January 2003). "The Importance of Herbaria". Plant Science Bulletin. 49 (3): 94–94. Retrieved 2 February 2016. ↑ Funk, Vicki. "100 Uses for an Herbarium (Well at Least 72)" (PDF). peabody.yale.edu. The Yale University Herbarium. Retrieved 2 February 2016.